Main advantage - user configurable inputs from PC program without any need to open the data logger unit. Each data logger contains 16 inputs for measurement and record of both analog and two-state values. Each input is individually configurable from user PC program to one from 17 measuring ranges. Also signals from sensors working on RS485 bus with ModBus or Advantech protocol can be recorded. Universal sixteen channel data logger is designed for data acquisition from sensors of variety values, alarm state indication, optionally for control of consecutive processes. Data is possible to download to the PC via USB, RS232, Ethernet interfaces or GSM modem for processing. Free program for monitoring system for Windows is ready to download. Configure inputs for different input signal types from the PC program. Individully configure each input channel for measurement, alarm evaluation and data logging , including individual logging interval for each input. Individually program each input channel for different modes of record (continuous record, time dependent record, record only if specified logic conditions are matched, record triggered by external signal, etc.). Set up to four different logic conditions for each channel to active alarm. Each condition compares measured values from inputs with set limits. It is possible to set hysteresis and delay of condition validity. Indicate alarm state after matching defined combination up to four alarms from any inputs. Activate selected relays depending on alarm states by means of output relays module. Monitor online data�by means of the Ethernet interface and Comet DBM program receiving SOAP messages. Receive information from monitoring system by means of SMS messages via GSM modem - actual values, alarms, memory occupation etc. Assign to each input channel name of actual recorded process to identify monitored object (e.g. type of monitored product). It is enabled to select this name from data logger keyboard during the operation. Each data logger input can be configured by the user from PC program depending on input signal character for measurement of dc current and voltage of different ranges, signals from RTD temperature sensors and thermocouples or dual-state signals with parameters in accordance with the table. Inputs are not galvanically isolated from each other. Binary input for two-state signal input voltage for state "L" (IN-COM) < 0.8 V (Rin < 1 kOhm). resistance of closed contact for state "L" (IN-COM) < 1 kOhm. input voltage for state "H" (IN-COM) > 2 V.
resistance of closed contact for state "H" (IN-COM) > 10 kOhm. minimum duration for sensing of change: 200ms. - optionally E.g. data acquisition from temperature, humidity, pressure sensors Tx41x, Hx43x. input serves for reading from devices supporting protocol ModBus RTU or Advantech. Connected to terminals next to terminals for channel 15 and 16. Input can work with 16 devices. Figure: rear view of data logger inputs with switch for selection of power voltage 12Vdc/24Vdc for connected sensors. Serial input RS485IN is optional. Figure: front view - communication interface, alarm outputs, connection of power. Ethernet interface is optional. Enables to read actually measured values by means of industrial standard Modbus. Data is available in several formats. 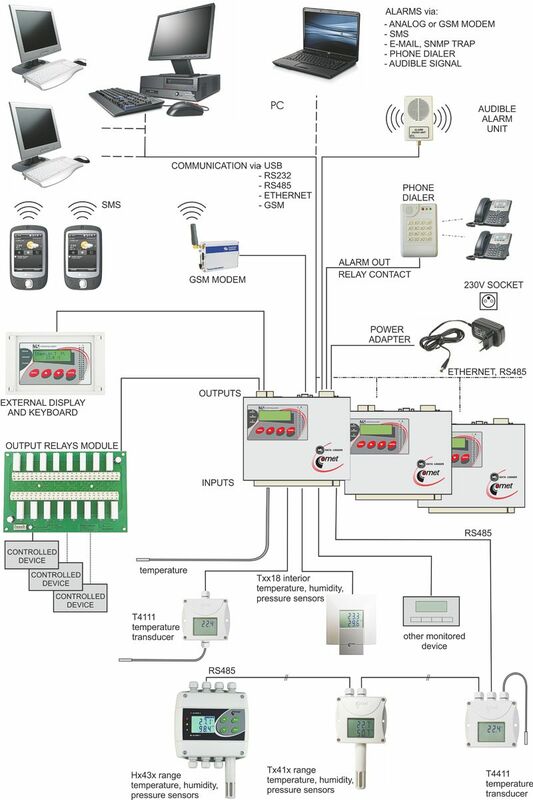 Protocol is suitable for implementing of MS data logger to SCADA system. Actually measured values can be acquired by means of SNMPv1 protocol. MIB tables are available for free.Designed especially for IT applications and use in��managed� computer networks. Protocol designed for data logger integration to own www infrastructure. Available actual values can be captured by www server (Apache, IIS) and processed by the user.Communication protocol SOAP version 1.1. is supported. By means of this protocol data logger sends actual values in preset intervals to specified server. Data logger sends warning emails up to three different addresses. E-mail is immediately sent after alarm state of monitored technological process appears. User is also informed on error states of device itself (measuring channel error, fulfilling of internal memory, self-test error). SMTP servers requiring autentization are also supported. Network parameters can be set directly from data logger display. It is possible to change IP address, subnetwork mask and initial gate. WWW server is built in the�device. Here it is possible to monitor actual values, alarm states and information on data logger.Also access password for www pages can be entered. WWW pages are user modifiable. Free SDK description is available to create own www pages. Control of remote condition and relays is enabled also via www interface.